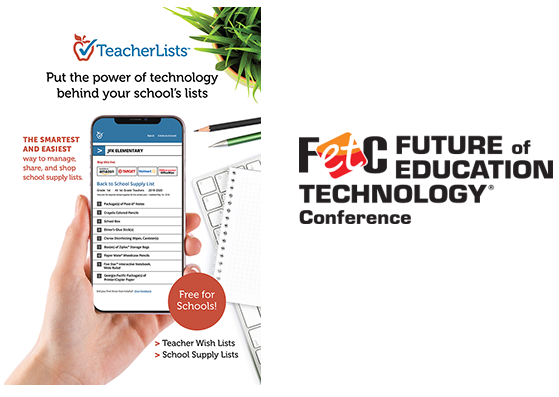 Home » EdTechs and School Technology » Thank You for Visiting TeacherLists at FETC2019! Thank you for taking the time to visit us last week at FETC! We hope you had a great conference and that your visit with us was informative and productive. We wanted to take this opportunity to let you get to know us a bit better and explain in more detail what TeacherLists is. TeacherLists is a school supply list and classroom wish list service that makes it super easy for teachers and administrators to manage the back-to-school supply process. Supply lists are uploaded to our platform in seconds and we digitize those lists in a format that is shareable with major national retailers including Target, Walmart, Amazon, Office Depot/Office Max, EPI, and more! Once your supply lists are ready on our platform, we send an email with links to the lists that can be shared with parents on school or district websites via social media or email—really any way you communicate with parents. And the best part about TeacherLists? It’s 100% free to use for both schools and parents. Our revenue stream comes from our partnerships with national retailers and CPG brand partners. If parents prefer to shop in-store, their list is available right on their phones—no more printouts to forget or misplace! For those who still wish to print their lists, they can simply click on the print button at the top of the list. Ready To Give TeacherLists a Try? If you’re ready to try TeacherLists, head on over to our Powerloader and upload a list. We accept most formats (word doc, pdf, jpeg, text, etc.). We’ll get right to work once your list is uploaded and send you a link to it when ready. Don’t worry, you can edit and change your list at any time. Check Out Our TeacherLists Product Videos! We’ve put together some short video presentations that illustrate how TeacherLists works. Take a look below. Did you visit our booth at FETC and forget to ask a question or would simply like more information?